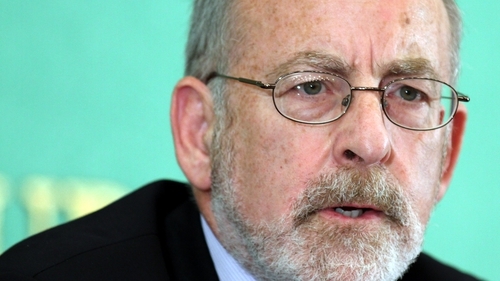 The Central Bank will introduce measures to limit the amount that banks can lend to customers looking to buy a home, according to Governor Patrick Honohan. Mr Honohan said details of the measures, which could cap the size of a loan based on the value of the property or the income of the borrowers, would be announced on Tuesday. Speaking at UCD’s Economics Society, he said given how badly banks had misjudged the riskiness of loans during the boom, it was “hard to deny” that a cap of some kind would stop a similar situation arising again. In the past banks had followed rules on loan-to-value and loan-to-income ratios “which seemed to keep them out of trouble”, he said, and there would be a benefit to reintroducing them as property prices began to rise again. “Even in the absence of a credit-driven bubble, there is much to be said for bringing back some rules of this type,” he said. He said any such rules were not governed by European law and were at the discretion of national authorities. Mr Honohan also supported a call by the Irish Fiscal Advisory Council for the Government to use any additional revenue to pay down the national debt. He said doing so would help convince international investors markets that it was determined to meet fiscal goals set out by the EU. He also noted rising interest rates amongst non-tracker mortgage holders, despite the European Central Bank rate being at a record low level. However, he said he would not support the Central Bank being given powers to set a ceiling on such rates, as it could discourage a foreign company from entering the market to compete. “If local banks are charging unnecessarily high interest rates, that will be an inducement for new entry into lending here,” he said. Meanwhile, the country's lenders are taking too long to deal with loan arrears and the delays are interfering with government efforts to sell off bank stakes nationalised during the financial crisis, Professor Honohan also said during this speech at UCD. "Perceptible progress in dealing with arrears is now undeniable. But it is still too slow," he stated. "The persistence of chronic arrears cases inhibits the ability of government to attract buyers for the banks that have been nationalised and results in higher imposed capital requirements than would otherwise be necessary," he said.